As you leave the service station, turn right on Lana‘i Avenue. 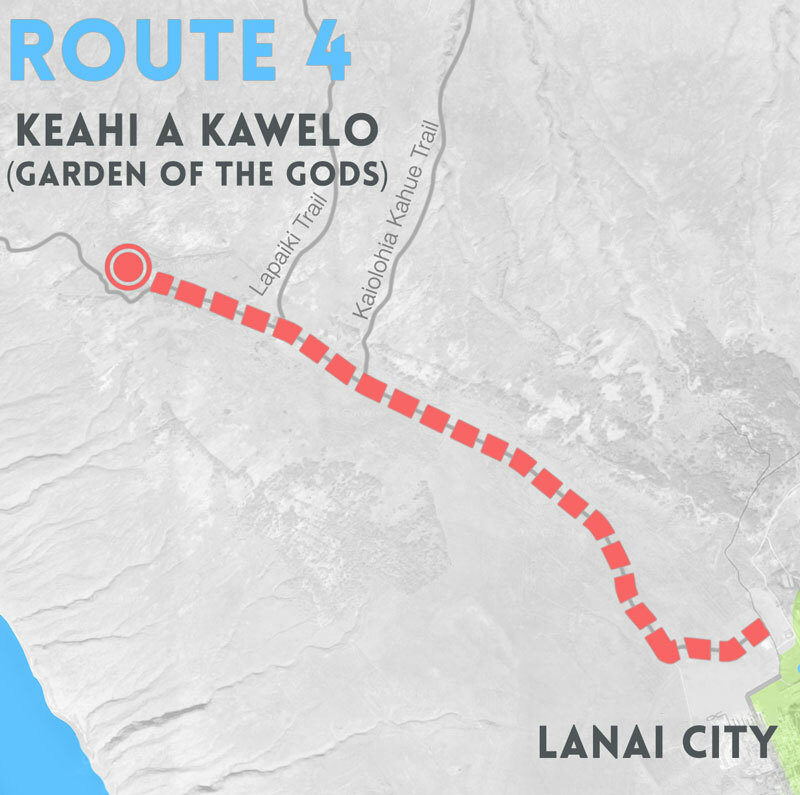 You’ll pass through the center of Lana‘i City and past the Lodge at Koele. Watch for the rock sign on the right side of the road for the Garden of the Gods. Turn left onto the dirt road between the tennis courts and the horse stables. Go past the stables and turn right at the next large intersection (look for the rock sign) and follow this dirt road toward the north west. Keep a sharp lookout for axis deer, especially at dawn and dusk in the pastures. After approximately three miles you’ll come to a fenced-in area. You must cross the cattle grates into the actual Kanepu Garden of the Gods forest. This will be the third set of cattle grates that you will have crossed. Stay left at the major fork in the road. There are some very rare species of plants in this area and there is a self guided trail 3/4 of a mile on the right. Soon you’ll come to the Garden of the Gods, a unique collection of rock formations. This is a beautiful place for photographs especially at sunset. If you sit quietly you may see both deer and mouflon grazing in this lunar setting. You’ll see the island of Moloka‘i in the distance, stretching from the far left to the right. O‘ahu will only be visible when it is extremely clear, just past the point where Moloka‘i disappears in the sea on your left. The west Maui mountains are on your right. 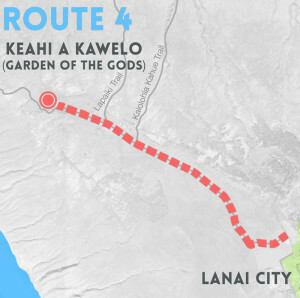 Depending on the visibility you might be able to see the hotels from Ka‘anapali past Napili all the way to Kapalua. The Au‘au channel stretches between both islands.